Remove the bolt and transmission control cable bracket No.2. Disconnect the wire harnesses from the 2 clamps. Remove the 2 bolts and 2 clamps. 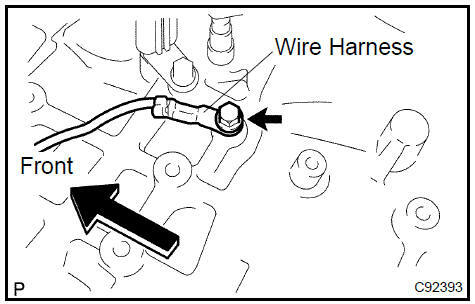 Remove the bolt and disconnect the wire harness. 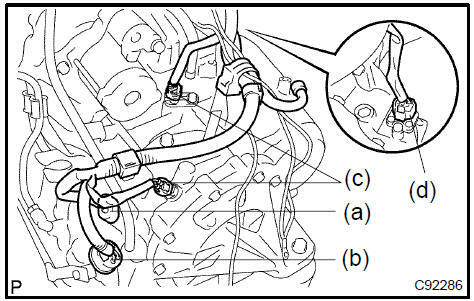 Remove the nut and disconnect the starter wire. Remove the 2 bolts and starter assy. Disconnect the transmission wire connector. Disconnect the park/neutral position switch connector. Disconnect the 2 speed connectors. Disconnect the speedometer driven gear connector. Remove the bolt and oil cooler tube clamp. 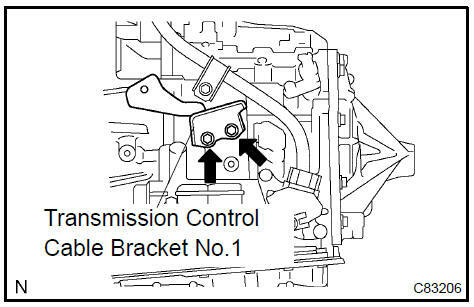 Remove the 2 bolts and transmission control cable bracket No.1. Remove the ATF level gauge. 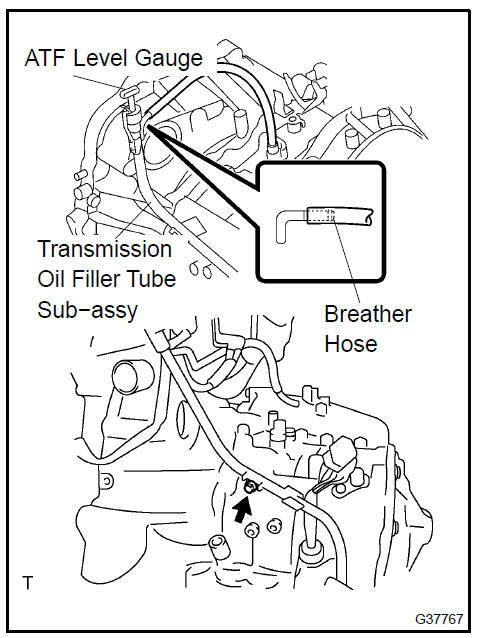 Remove the breather hose from the automatic transaxle. Remove the bolt and transmission oil filler tube sub−assy. Remove the O−ring from the oil filler tube. Remove the oil cooler inlet tube No.1. Remove the oil cooler outlet tube No.1. Remove the 3 bolts and engine mounting bracket FR. Remove the flywheel housing under cover. 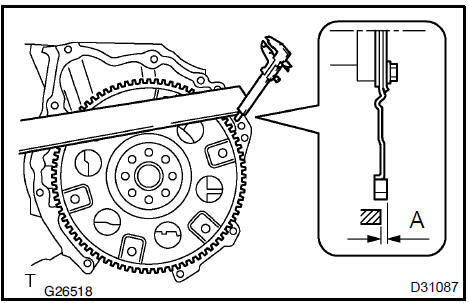 Turn the crankshaft to gain access and remove the 6 bolts while holding the crankshaft pulley bolt with a wrench. HINT: There will be one green colored bolt. separate and remove the automatic transaxle. 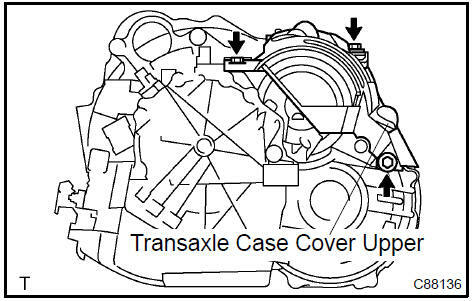 Remove the 3 bolts and transmission case cover upper. Install the transmission case cover upper with the 3 bolts. Using vernier calipers and a straight edge, measure the dimension ”A” between the transaxle fitting part of the engine and the converter fitting part of the drive plate. Set the key of the front oil pump drive gear to the top and put a mark on the housing. 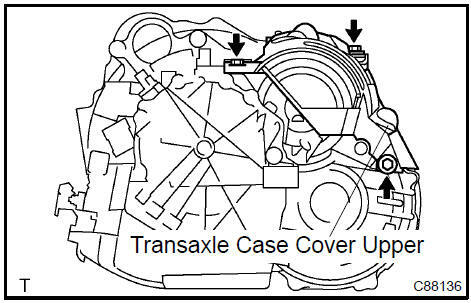 Put a mark on the torque converter clutch so that its groove can be clearly indicated. 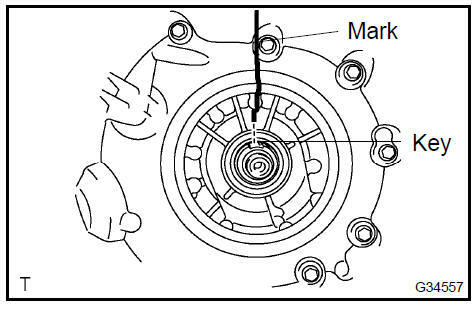 Match the 2 marks on the transaxle case and the torque converter clutch and fit the splined part of the input shaft to the spline part of the turbine runner. Rotating the torque converter clutch, fit the spline part of the stator shaft with the spline part of the stator. HINT: Rotate it about 180 degrees. Rotating the torque converter clutch, match the 2 marks on the case and the torque converter clutch again and fit the key of the oil pump drive gear into the key way of the torque converter clutch. NOTICE: When rotating the torque converter clutch, do not push it by excessive force. Using vernier calipers and a straight edge, measure the dimension B shown in the illustration and check that B is greater than A measured in step a. Install the automatic transaxle to the engine with the 8 bolts. Apply a few drops of adhesive to 2 threads on the tip of the 6 torque converter clutch mounting bolts. Install the 6 torque converter clutch mounting bolts. NOTICE: First install the green colored bolt and then the remaining 5 bolts. Install the flywheel housing under cover. Install the engine mounting bracket FR with the 3 bolts to the automatic transaxle. Coat a new O−ring with ATF, and install it to the oil filler tube. Install the oil filler tube to the automatic transaxle with the bolt. 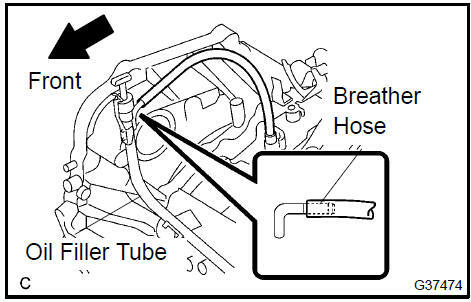 Install the breather hose to the automatic transaxle. Install the ATF level gauge. Install the control cable bracket No.1 with the 2 bolts. Temporarily install the oil cooler outlet tube No.1. Temporarily install the oil cooler inlet tube No.1. Install the oil cooler tube clamp with the bolt. 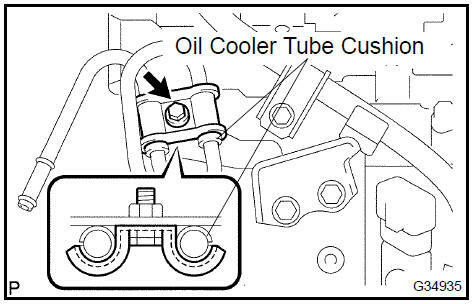 HINT: Install them so that the oil cooler tube cushion is positioned as shown in the illustration. Torque the oil cooler inlet tube No.1. Torque the oil cooler outlet tube No.1. 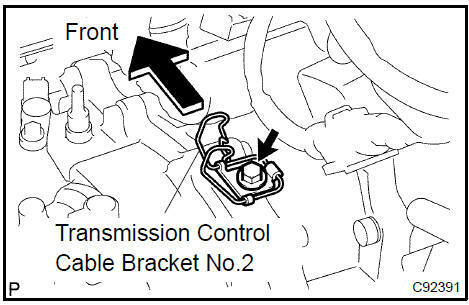 Connect the transmission wire connector. Connect the park/neutral position switch connector. Connect the 2 speed connectors. Connect the speedometer driven gear connector. Install the starter assy with the 2 bolts. Connect the starter wire with the nut. Connect the wire harness with the bolt. Install the 2 clamps with the 2 bolts. Install the transmission control cable bracket No.2 with the bolt. 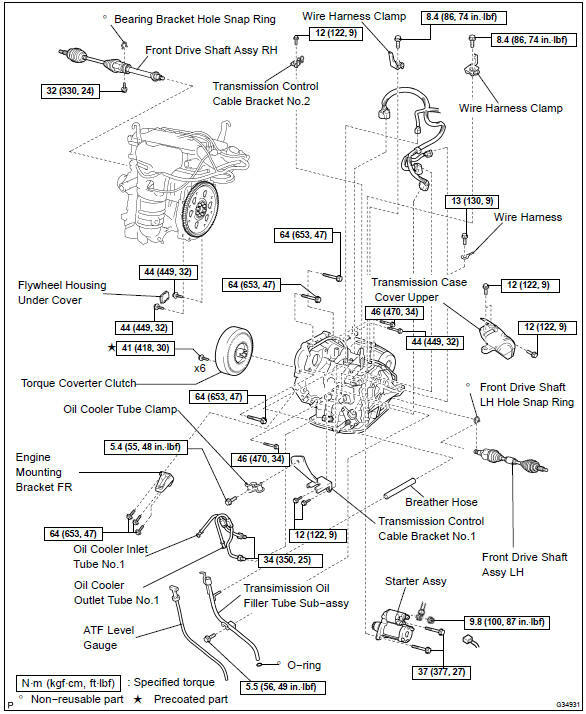 NOTICE: Perform the RESET MEMORY (AT initialization) when replacing the automatic transmission assy, engine assy or ECM . HINT: RESET MEMORY can not be completed by only disconnecting the battery terminal.